NMR chemical shifts are very widely used in analytical chemistry but it is not well known that they involve a lot of information about the electronic structure of molecules. A purpose of the study is to clarify the electronic mechanisms of the metal chemical shifts and to offer the means for understanding the natures of bonding in the metal complexes. Since the chemical shift measures the angular momenta of electrons induced around the resonant nuclei by the applied magnetic field, the p- and/or d-orbital electronic structures of the metal complexes are reflected to their chemical shifts. 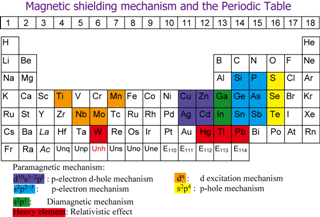 Nakatsuji has shown that the primary mechanisms of the metal chemical shifts are the intrinsic properties of the resonant nuclei characterized by their positions in the periodic table. The relativistic effects, spin-orbit effect in particular, are very important for the chemical shifts of molecules including heavy elements. We have developed a method to calculate these relativistic effects. We showed for the first time that the spin-orbit effect is the dominant origin of the proton and 13C chemical shifts in the HX and CH3X (X=F, Cl, Br, I) series of molecules, respectively. We performed later the Dirac-Fock four-spinor calculations of various molecules in the magnetic field. The relativistic effects and the electron correlation effects couple strongly, so that they must be calculated at the same time.